Sad News | Grant Morrill, Jr. Passes, 10/09/16. 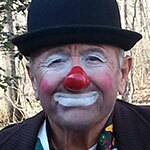 Much-beloved throughout his life and career Grant Morrill, 79, died at the Hershey Medical Center, after many years as “Spoony the Clown” and a Zembo Shrine Clown named “Boss”. Earlier he had served in the U.S. Air Force (1955-59) and in the U.S. Navy (1959-64) and traveled the world.